Anna Redding is back in a familiar spot – match play at the Women’s North & South Amateur. VILLAGE OF PINEHURST – A year ago – almost to the day – Anna Redding was fighting tears. She may not come right out and say it, but the idea of winning of the Women’s North & South Amateur on Pinehurst No. 2 is something that Redding may want more than any other player in the field. The 2013 Girls North & South Junior Champion is playing her fifth Women’s Amateur, and a year ago, the Concord native came agonizingly close, falling in the championship final to Isabella Fierro in a match Redding led 2-up through eight holes. But there is something about Redding and the North & South. She reached the semifinals in 2015, the quarterfinals in 2016 and the championship match in 2017. And on Tuesday in the second round of 116th playing of the longest consecutively running women’s amateur in the United States, Redding rebounded from a 6-over 77 in the first round to close with a staggering six birdies on the back nine of a treacherous No. 2 for a 3-under 68. That allowed her to finish in a tie for the lead with medalist Anita Uwadia at 3-over 145. Outside of two holes on Monday – Redding made triple bogeys on the 4th and 14th holes – Redding has been among the championship’s steadiest players in medal play. Despite shooting 77, she made three birdies to hold her round together, and entered Tuesday well inside the cut line for the Round of 32 and match play, sharing a tie for 20th. She started fast in the second round, making a birdie on the first hole before giving the shot back on the second. And bogeys on 7 and 8 dropped her to 8 over for the championship. The manual scoreboard at the Women’s North & South leaves an empty spot for Anna Redding after her masterful 3-under 68 rocketed her up the leaderboard. But Redding caught fire on the back nine, making birdie on the next three holes, all of them from inside 12 feet. She made a 30-footer for birdie on the par-3 15th, then backed that up with another birdie on the par-5 16th. She closed in style on 18 with another birdie, this one from 10 feet, and walked off the course past the manual scoreboard as the leader in the clubhouse. The only problem? Redding had come back from so far in the field the scoreboard operator was still scrambling to create a placard with her name, leaving, for the moment, an empty spot for the leader. Anita Uwadia is the medalist of the 116th Women’s North & South Amateur. While Redding had the round of the day, there’s no doubt which player in the field has put together the two most consistent rounds of the tournament. South Carolina junior Anita Uwadia, originally from Newcastle, England, had rounds of 73 and 72 to tie Redding for the top spot, then promptly birdied the first playoff hole to win medalist honors and take the top seed into match play. And she has the hardware to back it up. Uwadia’s reverence for No. 2 never seems far from her lips, and was evident after winning the playoff. “Just walking on the 18th green, you think about all the greats who have walked there before you,” she said. “Payne Stewart walked there, Tiger Woods, Rory McIlroy – all the great players you can think of. Defending champion Isabella Fierro will be a dangerous high seed in match play. It was another tough day on No. 2, with the scoring average in the second round just a shot better than Monday’s first round at 79.0. Still, the field for match play boasts several of the tournament’s top players. Defending champion Isabella Fierro, of Mexico, made the cut on the number, shooting an 8-over 79 to finish with a two-day total of 13-over 155. First-round leader Malia Nam had a 77 after her first-round 69, but still takes the No. 3 seed into match play. Jaclyn Lee, who nearly won the NCAA Championship in May, finished in a tie for seventh at 7-over 149 following a 74 on Tuesday. Jennifer Chang, of Cary, and one of the most decorated prep recruits of the last several years before signing with Southern Cal, also tied for seventh at 149 after a 73. North Carolina senior Kelly Whaley, the daughter of the future President of the PGA, Suzy Whaley, is also tied for seventh after a 76. Suzy is not in Pinehurst watching Kelly because she is preparing for the inaugural U.S. Senior Women’s Open in Chicago this week. The field has been cut to 32 and the championship now moves to match play. The Round of 32 and Round of 16 will be played on Wednesday while the quarterfinals and semifinals will be played on Thursday. The Championship’s finals will be played on Friday morning beginning at 7. Admittance is free to the public, which is encouraged to attend. Women’s North & South champions are among the legends of the game, and include Babe Zaharias, Louise Suggs, Peggy Kirk Bell, Hollis Stacey as well as Brandie Burton, Brittany Lang, Morgan Pressel and Yani Tseng. As much as the North & South is a championship with a great past, it also continues to foster a great legacy. Eleven of the last 15 Amateur champions have joined the LPGA Tour, four of whom have won major championships – Pressel, Tseng and Lang, who won the 2016 U.S. Women’s Open. 2011 Women’s North & South Champion Danielle Kang won her first major championship in 2017 at the KPMG Women’s PGA Championship. The Women’s North & South has drawn the top amateur women from around the country and is the longest consecutively running women’s amateur championship in the country. Its first championship was played in 1903. No. 1 Anita Uwadia vs. No. 32 Natalie Srinivasan, 7 a.m.
No. 16 Julienne Soo vs. No. 17 Julia Johnson, 7:08 a.m.
No. 8 Jaclyn Lee vs. No. 25 Haylee Harford, 7:16 a.m.
No. 9 Kelly Whaley vs. No. 24 Allisen Corpuz, 7:24 a.m.
No. 4 Ivy Shepherd vs. No. 29 Brigitte Thibault, 7:32 a.m.
No. 13 Stephanie Bunque vs. No. 20 Naomi Ko, 7:40 a.m.
N0. 5 Gabi Ruffels vs. No. 28 Evelyn Arguelles, 7:48 a.m.
No. 12 DeeDee Russell vs. No. 21 Kathryn Carson, 7:56 a.m.
No. 2 Anna Redding vs. No. 31 Anna Morgan, 8:04 a.m.
No. 15 Ana Paula Valdes vs. No. 18 Gurleen Kaur, 8:12 a.m.
No. 7 Jennifer Chang vs. No. 26 Siyun Liu, 8:20 a.m.
No. 10 Rebecca Kay vs. No. 23 Chia Yen Wu, 8:28 a.m.
No. 3 Malia Nam vs. No. 30 Isabella Fierro, 8:36 a.m.
No. 14 Stehpanie Lau vs. No. 19 Tze Han Lin, 8:44 a.m.
No. 6 Emma Albrecht vs. No. 27 Elsa Moberly, 8:52 a.m.
No. 11 Amanda Doherty vs. No. 22 Addie Baggarly, 9 a.m.
Our most popular year-round golf package includes an extra round of golf. 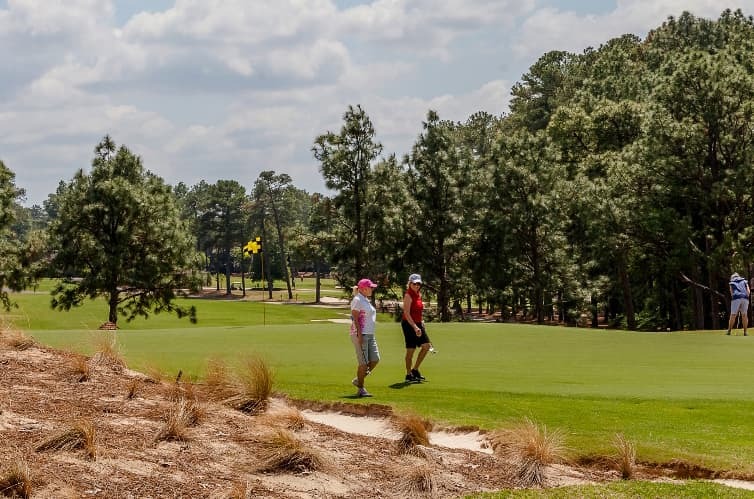 Yes, I would like to receive Pinehurst emails including exclusive offers, events & resort news. I understand that Pinehurst will use my data to personalize marketing communications. Be the first to know about special packages, events and resort news. Contact us to plan your next golf getaway. Call to book your accommodations, tee times, spa treatments and more.